The outgoing CIA director secured support from 57 senators, with 42 voting no and one senator absent. It's one of the slimmest margins for the job in recent history. 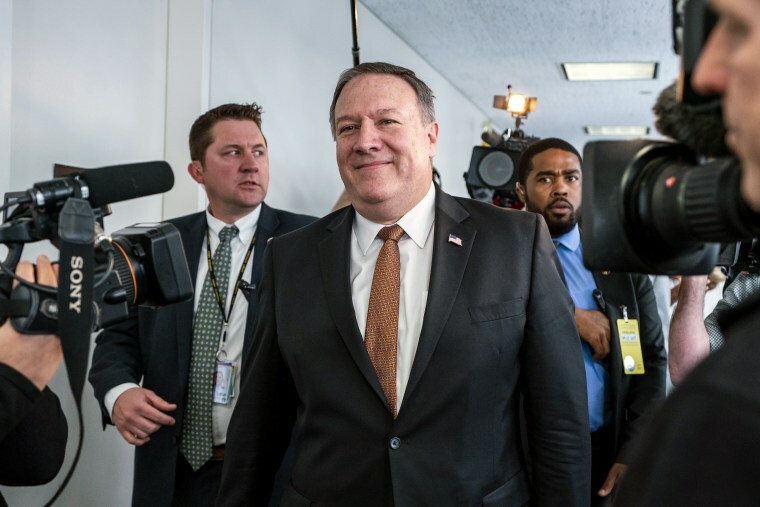 WASHINGTON — The Senate narrowly confirmed Mike Pompeo to be secretary of state on Thursday, clearing the path for him to take over as the top U.S. diplomat just as President Donald Trump faces high-risk moments on Iran and North Korea. Pompeo, the outgoing CIA director, secured support from 57 senators, with 42 voting no — one of the slimmest margins for the job in recent history. Every past nominee for the job since at least the Carter administration has received 85 or more yes votes in the Senate, with the exception of Trump's first secretary of state, Rex Tillerson, who got 56. Shortly after the vote, he was sworn in as the U.S.'s 70th secretary of state and was expected to depart within hours of the vote for Europe on his first trip as secretary of state. Pompeo, a former Kansas congressman, is expected to guide Trump's foreign policy in a more right-leaning direction than Tillerson, the former Exxon Mobil CEO fired by Trump on Twitter last month. He inherits a State Department and diplomatic corps that is deeply demoralized after a tumultuous first year under Tillerson, who pushed budget and staff cuts and eschewed public appearances while leaving key diplomatic positions unfilled. The Senate vote followed an uneasy confirmation process for Pompeo that underscored President Donald Trump's growing difficulties in getting nominees in place for top positions. On Monday, it appeared Pompeo would fail a vote in the Senate Foreign Relations Committee, but the panel ultimately cleared him after last-minute support from Republican Sen. Rand Paul of Kentucky. A long list of pressing issues awaits him including a decision on the Iran nuclear deal and Trump's upcoming summit with North Korean leader Kim Jong Un. In the run-up to Pompeo's confirmation, his backers emphasized his resume as a West Point and Harvard Law School graduate and former congressman who enjoys a close relationship with Trump particularly on North Korea. Pompeo, as CIA director, traveled to Pyongyang over Easter after being nominated for secretary of state. In the North Korean capital he met with leader Kim Jong Un ahead of the planned meeting with Trump, expected in late May or June. "He's the perfect person to come in at this time and lead those efforts" on North Korea, Senate Foreign Relations Committee Chairman Bob Corker, R-Tenn., said on the Senate floor moments before Pompeo was confirmed. Pompeo will take the helm at the State Department ahead of Trump's expected decision on May 12 about whether to withdraw from the Iran nuclear deal and re-impose sanctions on Tehran. Pompeo, a staunch Iran critic, has long deplored the 2015 nuclear accord, but has supported Trump's efforts to get European allies to strengthen restrictions on Iran. "If there's no chance that we can fix it, I will recommend to the president that we work with our allies to achieve a better outcome and to achieve a better deal," Pompeo said in his confirmation hearing earlier this month. In Brussels, Pompeo will keep up pressure on NATO's European members, particularly Germany, to boost their defense spending to 2 percent of their gross domestic product by 2024 as they pledged to do at an alliance summit in Wales in 2014, one senior official said. The official singled out Germany, the alliance's largest and wealthiest European member, for not having plans to increase defense spending to more than 1.25 percent of GDP by 2021.